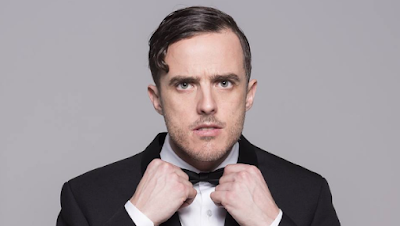 It's unfortunate when you attend a show only to be told that it has to be cancelled because the band has called in sick, but that is what happens with Melbourne Fringe Festival's Andre Tonight! - or so we are led to believe. However, an audience member drunkenly volunteers her services and once she plays some music for our host, Andre DiVenuto, he decides the show must go on - and so it does. Created by Chris Ryan and Mark Winter and performed by music theatre star Ryan, Andre Tonight! is an hour of laughs that just don't seem to end. Ryan encapsulates the late-night variety show, and the European 20-something from Epping (my hometown) perfectly. I'm not sure where Ryan grew up, but he has certainly done his homework as the language, mannerism and style - including the hideous comb-over - scream Epping. But Ryan is not simply mocking this northern suburbs boy (or the suburbs in general), as he brings much depth to the wannabe celebrty, at one point having the character almost breaking down for disobeying his parents and choosing to follow his own dreams instead. Similarly, audience/band member Meg has her own issues to deal, with popping anxiety pills like they were tic-tacs and getting incessant phone calls from her ex-partner. Despite the antagonistic behaviour towards each other, there is an immediate bond between the two characters, and it is highly entertaining to see it play out over the course of the show. There is also an added bonus with this show with the creators managing to get the services of a surprise guest to appear. While it’s best to not know in advance who this person is, it is a pretty remarkable coup that Ryan has orchestrated, resulting in many pleasantly surprised faces in the audience. It would be fair to say that Andre Tonight! has become the sleeper hit of this year's Melbourne Fringe Festival – and deservedly so. Ryan has created something quite special with Andre DiVenuto, and if the feedback from this show is anything to go by, there is a good chance Andre will actually achieve his dream of hosting his own chat show on Foxtel very soon. * Original review appeared on TheatrePress on 23 September 2016.